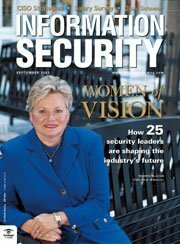 Cover story: Profiling 25 outstanding technologists, researchers and executives who are reshaping information security. Rhonda MacLean believes her success in infosec comes from finding and hiring the right people. Oracle CSO Mary Ann Davidson faced pressure from the get-go thanks to the company's Unbreakable marketing campaign. Bace guides startups as a venture capitalist with Trident Capital, while being CEO of network security consultancy Infidel. A former sportswriter, Chen conceived that antivirus scanners should migrate to the Internet gateway, where they could catch more viruses and worms. The longtime computer science professor is one of the world's top authorities on encryption and cyberterrorism. Security pros often talk about establishing an information security culture. These C-level execs explain how to make it happen. Surveys show information security salaries and bonuses continue to increase in a nevertheless unstable and mixed job market. In his new book, "Beyond Fear," Bruce Schneier advocates measuring risks and applying rational security. A new certification program by Risk Analysis Group sparked debate among infosecurity leaders about the credentials necessary for the role of CSO and CISO. Learn how corporate risk can be capitalized on in order to maintain a high profile for cybersecurity among enterprise board of directors. Although information security success relies on all parts of the four P's -- people, policy, process and product -- there is one that may really drive the profession. Check Point Software Technologies asserts that application intelligence is not just another example of marketing jargon used for hype -- but is it? Rather than constantly looking for the next point product, enterprises should focus on the vulnerability assessment process. The sudden necessity of Blaster patches has fueled the debate on how quickly vulnerabilities should be plugged and at what cost. CERT and ArcSight have teamed up for security information sharing in the hopes of establishing threat alerts on live Internet attacks.